Americans are up in arms right now over the near epidemic number of deaths of African-American at the hands of police, and rightfully so. African-Americans make up only 13 percent of the population, yet they are the victims in 26 percent of all police shootings. That is nearly 3 times the rate of whites. The outrage by the #Black Lives Matter movement is founded in statistical evidence which shows that the system inherently and with extreme bias disproportionately targets blacks. That being said, there is one group who no one is talking about that is targeted more than everyone else. 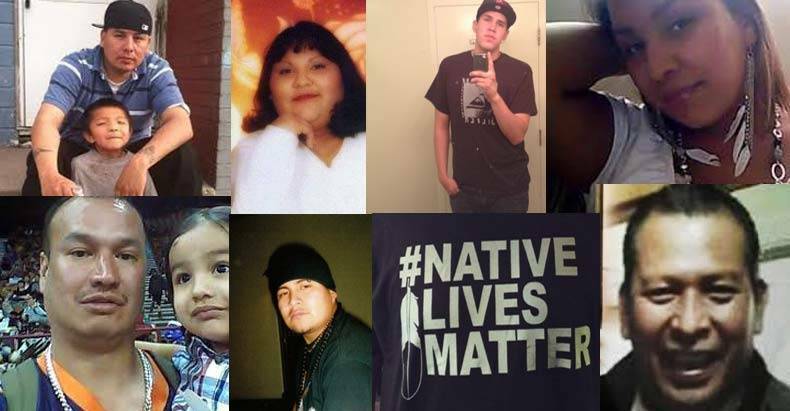 The racial group most likely to be killed by law enforcement is Native Americans. While Native Americans only make up 0.8 percent of the population, they make up 1.9 percent of all police killings. Unsettling reports of unfair treatment towards Native peoples by law enforcement are not isolated incidents—rather they are endemic of a deeply discriminatory justice system. Native American men are admitted to prison at four times the rate of white men and Native women at six-fold the rate of white women. Additionally, Native Americans are the racial group most likely to be killed by law enforcement. Where is the outrage in the media for Native Americans? It’s certainly not due to the lack of protests by the #NativeLivesMatter movement, as there are many of those. In fact, several of the Native American activists within the movement have been killed by police, causing even more outrage in the community. Earlier this month, Native American activist, Rexdale W. Henry, 53, was arrested for failure to pay a traffic fine. Five days later, on July 14, Henry would be found dead in a Neshoba County, Mississippi jail cell. Just days before Henry’s tragic death, another Native American woman was found dead in a jail cell. She was arrested for an alleged bond violation over a traffic charge. Sarah Lee Circle Bear was heard by her cellmates screaming for help prior to being found unresponsive in her cell. On July 12, Paul Castaway, a Native American who suffered from schizophrenia, was gunned down by police. According to witnesses, he was holding a knife to his own throat during an episode when police shot and killed him. Last December, 30-year-old Allen Locke was shot and killed by police, just one day after attending a protest against police brutality. Locke is a Native-American man who attended a #NativeLivesMatter rally that was being held locally. Native American children are also victims of the state as a recent report from TruthOut pointed out earlier this month. According to the report, in South Dakota, Indigenous children make up 15 percent of the child population, but comprise more than half the children in foster care. In order to profit off of the kidnapping of these children, South Dakota has claimed 100% of its foster children as ‘special needs’ for the past ten years in order to reel in extra money. The child “protective” system in South Dakota is incentivized by a $79,000 bonus per Native child. The situation is nothing short of modern day human trafficking and murder, yet the media is silent. Why? The answer to that question is not a simple one. However, one potential aspect of why the media and the government do not address the disproportionate targeting of natives by the state, is that it’s not divisive enough. The Black Lives Matter movement has been used by the government and MSM to stoke a level of divide which hasn’t existed in this country since the days of Jim Crow. This divide is a necessary function of controlled media and it’s an essential part of the state’s existence. #NativeLivesMatter doesn’t foster the same divide, therefore it’s not important to the establishment. However, it is important to those of us who care about the suffering and death of our fellow humans. The good news is that through the power of social media, together we can shed light on these injustices. By sharing these stories and the work of the Lakota People’s Law Project, we can help to change this paradigm.